Western Home Journal brought together Flathead Valley interior designers Hunter Dominick and Kay Sherman of Hunter & Company and Colton Martini of Camp Martini at Latitude 48 in Whitefish, Montana, to discuss what’s happening in the Flathead Valley interior design world with moderator Adora Maguire. Dominick, Sherman, and Martini discuss their approach to mountain living and trends as well as how they source their projects. The relationships Dominick, Sherman, and Martini enjoy with their clients are only found in the unique setting of Whitefish and the Flathead Valley. 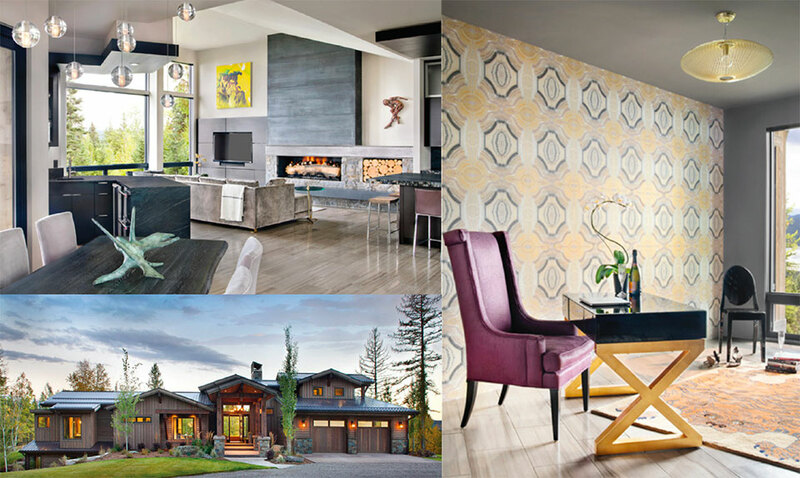 Discover how these top northwest Montana designers operate in an intimate discussion as they explore how designing and decorating in the Flathead Valley is unusual, from sourcing locally and online to creating unique surroundings for the mountain and lake environment in which they live. whj : How is working in Whitefish and the surrounding community unlike other areas? Hunter Dominick (HD): It’s interesting because of the small-town relationships we have. We have unique and dynamic relationships with artisans and craftspeople because they’re the people we work with and reside with in this small community. I think this makes Whitefish unique, more so than any other town. whj : Do you look to local artisans first to source? Colton Martini (CM): To Hunter’s point, I think we would all agree that it is really important to look to our local peers. Residing in a small town and having grown up in a small town in Montana, I understand how important it is to draw on local craftspeople and reach out to them first. We have some of the most talented, driven, and creative people in the Flathead Valley and Whitefish. Also, it’s very important to support the community that supports us. One of the most unique things we experience in Whitefish and the Flathead Valley is an intimate relationship with our clients. 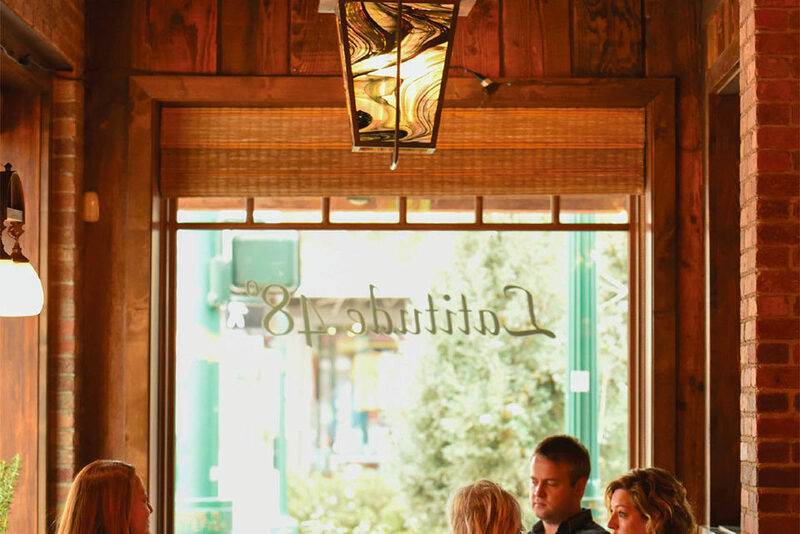 If we were in larger markets and metropolitan areas, we might not have access to some of our clients the way we do in Whitefish. We become more involved with them. They, too, enjoy the small-town environment and a level of friendship that is simply more dynamic than just a business relationship. whj : How often do you source area resources and craftspeople for projects, and are there any area resources that identify as Whitefish or Flathead Valley? 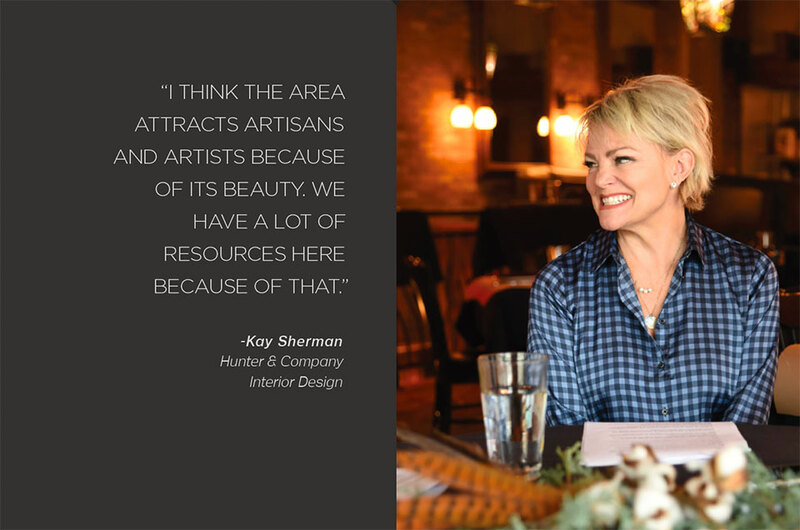 Kay Sherman (KS): I think the area attracts artisans and artists because of its beauty. We have a lot of custom resources here because of that. HD: In an 18-year time period, we have seen the downsizing of sawmills, but we have a lot of talented people who work with wood. They have a long history with it, and that is specific to Montana. Geographically, we do source upholstery from North Carolina and the Midwest because it’s more available. Some of our local fabric artisans are retiring, and they are not being replaced. We source from all over, but unfortunately many tradespeople such as a seamstress or an upholsterer are going away. CM: We do have fewer and fewer options for crafted tradespeople. For example, we really only have one or two people to call to install wall coverings. We’re being asked to install wall coverings more and more. HD: The boutique trade is coming back. Schools in Virginia and North Carolina are training people to do this, but they are not here in our area yet. CM: I would like to see more trade-based programs come back and certain industries here revived. The Flathead Community College is introducing more programs and hopefully we will see some crafted trades getting a new life. There’s one upholsterer in a 200-mile radius. It’s a dying trade here. 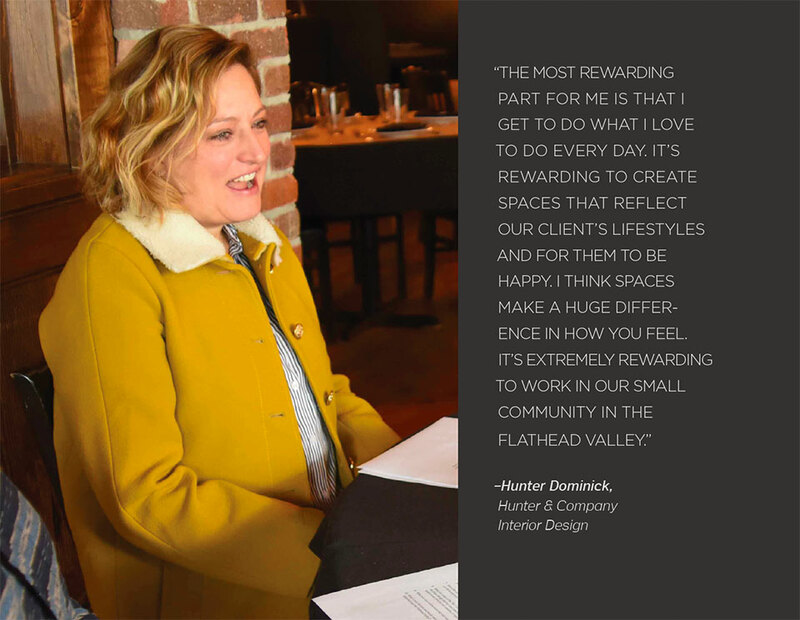 whj : How do you accommodate the ideas and needs of your clients in Whitefish and what are the differences between your work in Flathead Valley compared to an urban center environment? CM: We’re the last on the line when it comes to getting things shipped to Montana and Whitefish. We’re also one of the last to see trends emerge because we’re so isolated from trendy areas. 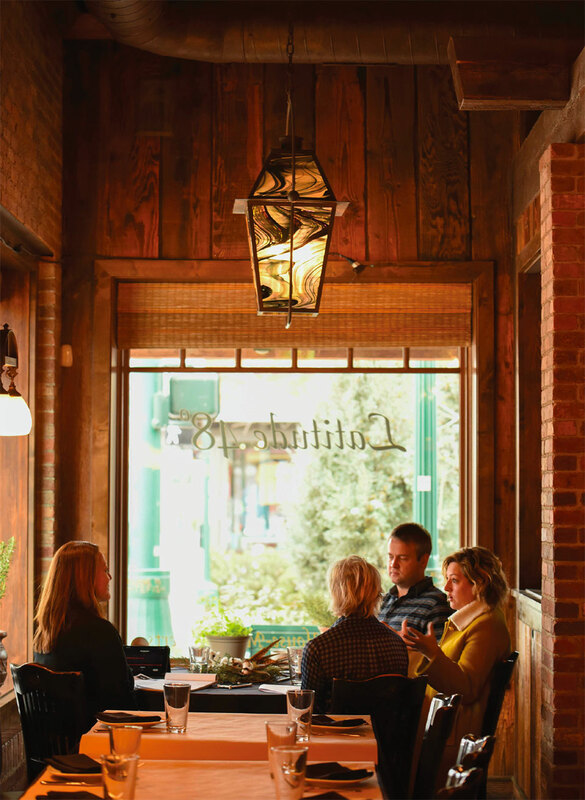 Montana is a state that tends to lean toward classic styling versus trend. It’s what is so great about being here. We see so many people coming from bigger urban areas exposing us to the trends that they’re seeing. They are bringing to us what they’re experiencing and witnessing in other areas and, in turn, want to incorporate that in their Montana home or project. As a designer, it is important that we travel to find those cutting-edge trends and experience them for ourselves. It is a unique challenge, and we’re not in the hyper-center of what’s going on trend-wise. In fact, we really set the trend in Whitefish using bits and pieces from many different styles, but we’re creating it in our own unique, Montana-inspired way. HD: Colton is correct. It’s a small-town vibe. With design trends, we follow fashion. Interior designers are always a year behind fashion design in terms of color forecasting and texture. With what’s up and coming, I agree we have to go to other markets for additional resources. We’re creative as to how we do that. It is difficult not having a design center at your fingertips. Having been in the Vail Valley and having access to the Denver Design Center was an invaluable resource in the beginning of my career. Kay and I have spent time updating a library, and I think a library is important because we don’t have resources at our fingertips at all times. whj : So you’re creating your own resources? 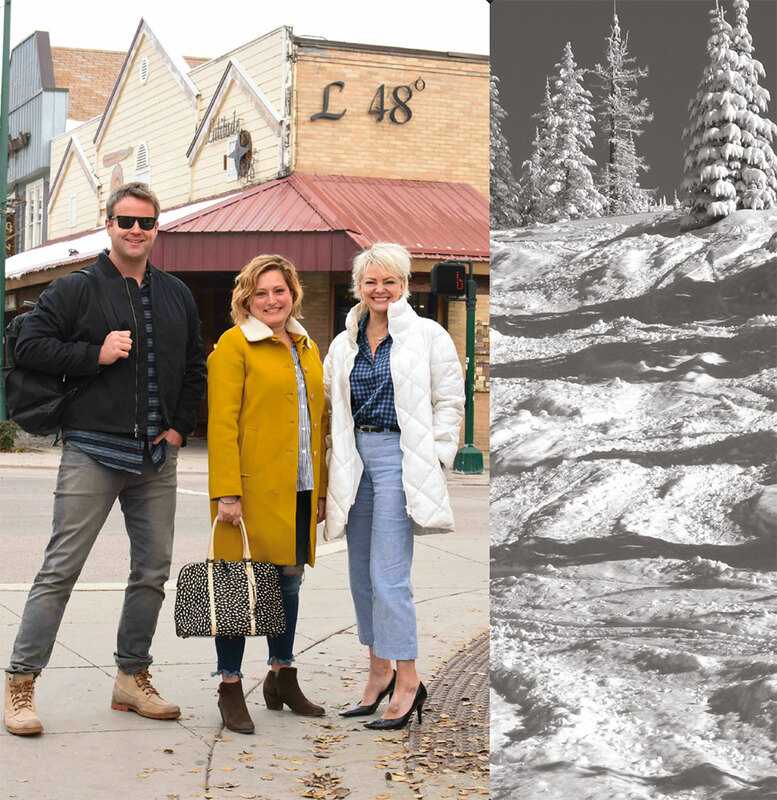 whj : How does lifestyle and mountain living affect concept and design? KS: I think the site can have a huge influence on the home depending on where it’s built, and how it’s going to look. At Ironhorse, there are so many basement areas that are beautiful, and they have gorgeous views. Where do you find that? It’s different than building on the lake. Another interesting point about Whitefish is that we have a mountain and a lake, which makes it different than most areas. There are lake homes and mountain homes, and they’re physically designed and decorated differently. whj : Talking about physical site, do you think Flathead Valley, being a valley, has every option for orientation regarding light and exposure? CM: I think what is interesting about Whitefish is that our lifestyle drives this area. In terms of our clients, most people move here because they want to be on the lake or in the mountains. They’re not necessarily following a job or have to be here solely for work. They want to be skiing in the winter and on the lake in the summer. This determines where they’re choosing to live. The site or location is what they’re seeking. It is the catalyst to a preferred lifestyle. The Flathead Valley has it all. HD: To that point, so many of these houses are vacation homes. The concept and the design have everything to do with having multiple families stay in the same home. It’s why there are lots of bedrooms and ski lockers, as you said. It’s all those things you do in your mountain home that you wouldn’t do in your primary home. whj : In your businesses, what percentage of your work is not in primary homes? HD: It has shifted. Flathead Valley is different especially coming from the Vail, Aspen, and Telluride communities where 70 percent are vacation homes and a smaller percentage are full-time homes. It’s opposite in Whitefish because it’s a much larger valley. I see more people moving here full-time. whj : You are designing for full-time family homes as well? CM: People are moving to Whitefish because they want a change or a slower pace of life. They want to live here and be outdoors. Their lifestyle affects how they choose to live in Whitefish, and that’s what they’re searching for when creating the perfect home. KS: Many times someone comes and stays in a vacation home, and it turns into, ‘I want to live here’ and creates an add-on or whatever they need. whj : How long have you all been in business in Flathead Valley? HD: Since 2000, so I’ve been in Whitefish almost 18 years. 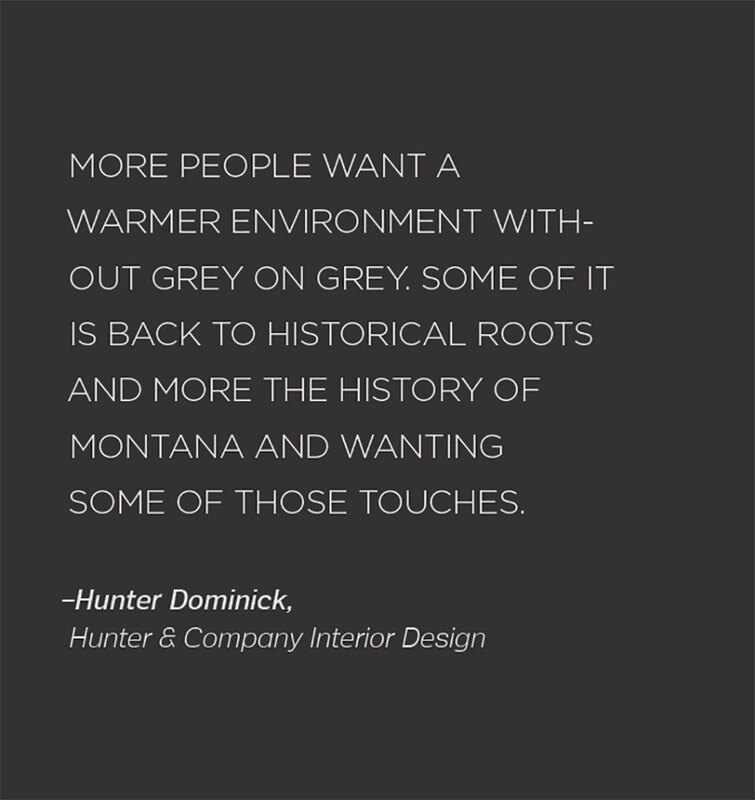 CM: Hunter really founded interior design in Whitefish. I cut my teeth on some of these bigger projects with Hunter, and I attribute a lot of what I have learned, and what it means to be a good designer, to Hunter and that period of my life. I have been working in and around Whitefish for five years, having come from Missoula and Seattle. I grew up in Montana and have spent most of my life here. whj : There has been a transition from vacation homes to primary homes in the last 20 years, is that still a trend? HD: I think so. Our valley is hitting all-time highs for real estate. Comparatively speaking and coming from a resort community where the average price of a home 20 years ago was two and half million dollars, Whitefish is an affordable place. We have a large valley, and that’s what’s special about this place. You have many different options, whether you want to be on a ranch or a mountain. Whether they are affordable or not is relative. CM: From the outside looking in, in terms of design, I’m seeing people wanting a cleaner and lighter aesthetic and more contemporary style. They want smaller homes, not as large, but, still with all the fine detail and interior styling we are used to seeing. We are implementing this in a simple and clean way with more of a “quality over quantity” mantra. I’m finding that clients are moving away from mountain modern, even though we are in the mountains, and seeking a more site-appropriate but contemporary vibe. HD: We’re doing fewer and fewer contemporary homes. More people want a warmer environment without grey on grey. Some of it is back to historical roots and more the history of Montana and wanting some of those touches. I agree with Colton that we’re trending toward smaller spaces, and clients of the Baby Boom and Generation X, even if they have the financial resources, don’t want a 6,000-square-foot home. They want a 2,000-square-foot home with flexibility and simplicity with all the bells and whistles that go with it. KS: They want more comfort and more color. HD: What’s fun about what we do is that everybody comes from a different history or background, and whatever tells their story is what goes into their home. The industry is swinging and people want to know where things are made, which wasn’t the case ten years ago. The throwaway generation might be pulling back a little. Your story reflects your family and lifestyle. CM: Leaning, again, on our local artisans. This is more highly sought-after. Clients want pieces to be made nearby or in a custom fashion. There is a new era of heirloom quality pieces, in a more localized, and in some cases, playful way. 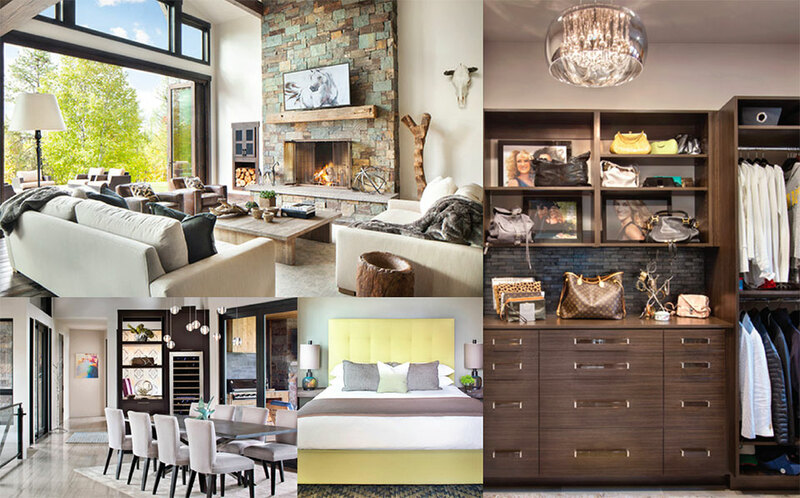 whj : What are some of your favorite interior and exterior areas to design? HD: I like kitchens and powder rooms. A powder room is a small space in your home, and you can do something unique in it because you don’t spend a lot of time there. Kitchens are the heart of the home and the focal point. People spend more time there and you put more focus on the kitchen than any other place. We don’t have formal rooms any more and the kitchen is it. CM: I like kitchens and powder rooms as well. KS: The kitchen is the middle of the home. It’s part of the living room. CM: Something Hunter taught me, when I was working with her, was to throw caution to the wind and go crazy in the powder room. We’ve done some amazing powder rooms and the crazier the better. CM: We’re moving away from bigger homes with vacuous spaces filled solely with drywall and carpet, but I do think basements are the most challenging spaces. They are stereotypically the most unplanned and misused spaces with endless options for finishes and uses. It’s about what you do with them to make them functional and homey versus just an open, oversized room with carpet and four painted walls. HD: I think the most challenging is the kitchen, as well as the most fun, because you are coordinating some different trades and different people to accomplish a particular look. The function of how a kitchen looks is a time-consuming process. The second most challenging space is the master bathroom. It’s personal space and reflective of function. KS: I think that clients who don’t know what they want are definitely more vocal in the kitchen, but not as much in the living room. CM: There are definitely more moving parts in the kitchen. Clients are specific about style and brand of appliances, and it’s a constant struggle to stay current on them to be able to educate your clients and steer them in the right direction. whj : Because a client has so much more access to knowledge then 20 years ago, is that perhaps why the kitchen is so difficult? CM: The most challenging part of interior design is trying to commit yourself to knowing about appliances and technology. We have to do careful research and appliances are changing all the time. Many of my clients, myself included, don’t even use their kitchens, but still want them to be functional and ahead of the curve. whj : Branding is still, in essence, in a kitchen? CM: Buying appliances, is in a lot of ways, like buying a car. HD: I think it’s changing. Technology has changed the appliance industry a great deal. There are two appliance companies, now, which are specifically selling non-branded appliances. People want a Sub-Zero or Wolf, or they don’t want a specific brand name. We have done a fair amount of those selections. In reality, there are only a few options for dishwashers that accommodate Riedel glasses. People are specific on how their things function, if it’s a self-cleaning oven or if it’s a dual-fuel oven or if you’re a baker. People come to me and say these things are important to them. Technology is another part to it. I see people who want to buy a traditional styled range or contemporary styled range, but no one is really using all this new stuff. I think it’s getting back to basics. CM: For me, it’s like shopping for a car. The more buttons, the less I will use it. I think it overwhelms most people to use all the buttons on the fridge or those TVs, for example. However, some clients are very, very into the latest and greatest technology. KS: Depending on the level of a home, the budget may be more on the high-end on the main level of the home and in the master bedroom than another part of the home. whj : What are some of the processes you implement when you approach a project? What type of preliminary work do you do? CM: It’s interesting because there are so many ways to approach it. In the past, we would get folders of magazine and torn-out book pages. Now, I’m almost always being directed to someone’s Houzz or Pinterest accounts. It’s up to you to go through and decide, as a designer, what the common thread is through all of these images. Sometimes people don’t know why they like what they like about certain images, and it’s up to us to decipher this. We, then, build on it and go through the process of creating a plan. HD: Recently, clients have been giving us ripped-out magazine articles, and it has come full-circle. It always starts with a timeline, a concept, and a budget. CM: It’s always project-specific. We can be commissioned to do the simplest of remodels or a client comes to you who has been designing a house for several years with an architect or design build team. HD: We try and educate our clients because design guidelines are different everywhere and there’s a shift for interior and exterior. CM: People are implementing indoor-outdoor living so there has to be an interior connection. It’s specific to every project. HD: Exterior spaces are being used year-round such as fire pit areas. We have a client who has a large fire pit. They built an ice bar to entertain with during the winter months. They do a great deal of outdoor entertaining. They’re embracing the lifestyle. CM: It is lifestyle. People who are moving here want to ski so we do ski rooms and homes with ski-in and ski-out designs. Fire pits are huge. There’s nothing I like more than sitting around a fire. It gives an exotic vibe. People look at Montana and think it’s an exotic place, and want to live as such. 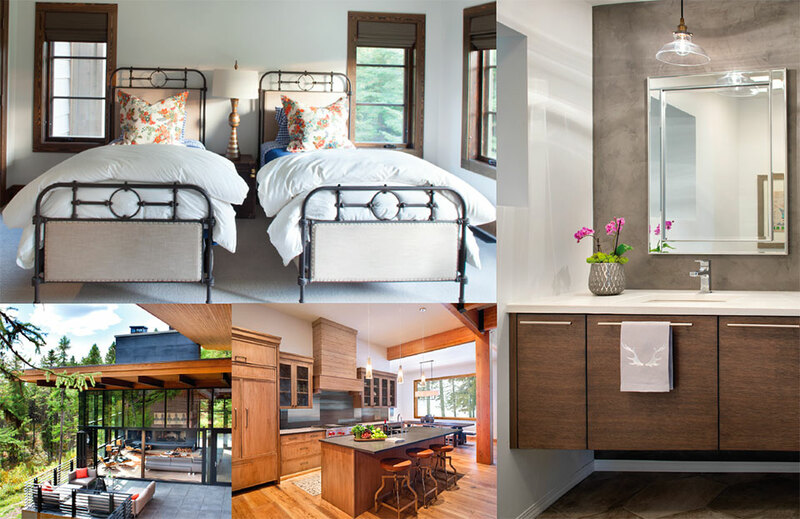 whj : What are some of the “hot” trends or materials being requested or suggested for home design interior and exterior such as wallpaper, green materials, smart home devices and systems, or space efficiency elements? HD: Because we are remote, many green products are not green. When we buy a recycled, LEED certified product, by the time it is shipped from California, it’s not as green. You can have something locally made here that would produce a lot less energy, but it’s not technically a certified product. There are very green products that could be LEED certified, but they don’t meet the requirements because we have not brought them in from a certified company. 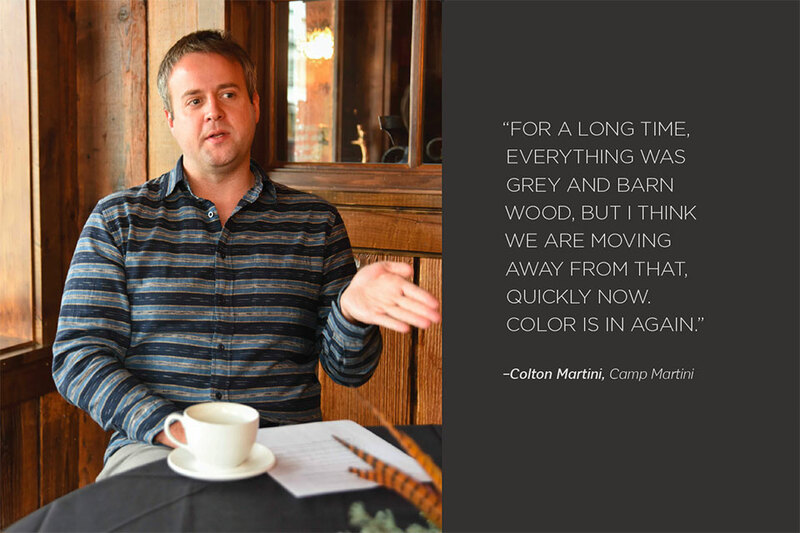 CM: For a long time, everything was grey and barn wood, but I think we are moving away from that, quickly now. Color is in again. KS: We have an artist we found through a local vendor with whom we work in Italy who is using mixed media and applying his designs on aluminum with epoxy layers on top. They are very lightweight, and can put on any surface, and they can be used on outdoor surfaces such as pools. There are those things that we can find and bring them in. HD: It’s mixed media, 3D, or what we do with wallpaper. In a small community and having grown up in North Carolina and Virginia in the design community, it was a similar scenario. Everyone knows everybody. CM: It’s a real challenge and extremely important not to reproduce the same thing in people’s homes over and over again. It’s easy to do that as many people like the same design trends. This is a job in itself. KS: It’s important because of the relationships we have with our partners to find different things and also with our local partners too. In larger metropolitan areas, you don’t have those relationships with your partners. CM: Many people in our community become friends, and as expected, are in each other’s homes. You walk a fine line to give people what they want without copying. It’s a challenge. We need to guide people and mentor—taking great precautions that what we are doing is something unique to them. It’s a philosophy for me. HD: It’s a philosophy and foundation for me, too. Growing up where people appreciate china and silver or a reclaimed light fixture on the front of a home, you appreciate those things. People are coming back to the idea that this is unique, and, ‘I’m the only one who has this.’ It’s also a budget thing. You can buy a solid walnut chest for less money than an imported chest from Bali on Pottery Barn. whj : What role does online sourcing and research play in your business, if any? CM: We do endless amounts of online sourcing. However, it’s important to go to markets, design centers, and travel and source things for yourself. You need to see products and know them. It’s important to have knowledge of those products or vendors before you order. You may order a pillow that might look amazing, yet the fabric is poor quality, something you wouldn’t have known looking at a picture in a catalog or online. HD: The value should meet the quality of the piece. HD: We know what we are purchasing. Our vendors, craftspeople, and our library are a huge part of what we do. People come in and want to flip through a catalog and not scroll through a computer. They come to us because they want to do things. KS: They want to see and touch fabrics. HD: It’s our job to know the companies and what they do. What kind of finishes do they have, and is it shipped in one piece? CM: We are the Restoration Hardware generation. If we want to be useful and still have a job, we have to generate something that is unique and interesting—not mass-produced. Because we all expect instant responses, waiting for a sample to arrive so our clients can see the leather or touch the wood is not always an option. If you don’t have a sample library for them to utilize, it’s ultimately not going to work. I do like it when clients have personal items or items with history they want us to work with. It gives the project a little more soul. HD: People’s lives change. They make changes in their homes accordingly. 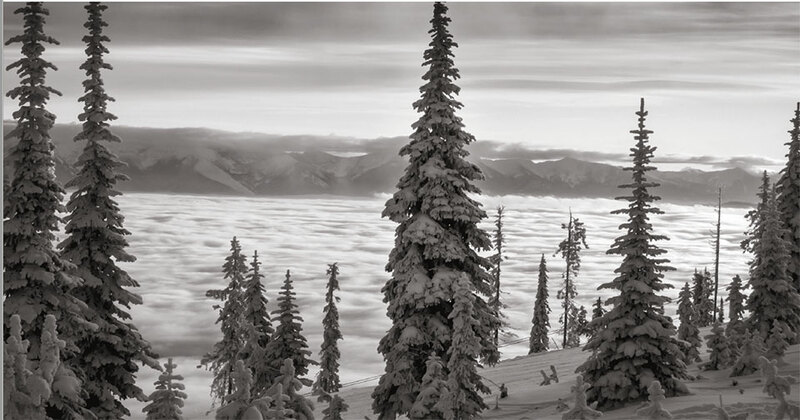 whj : What is your favorite and most rewarding part of your business, especially in Whitefish and the Flathead Valley? 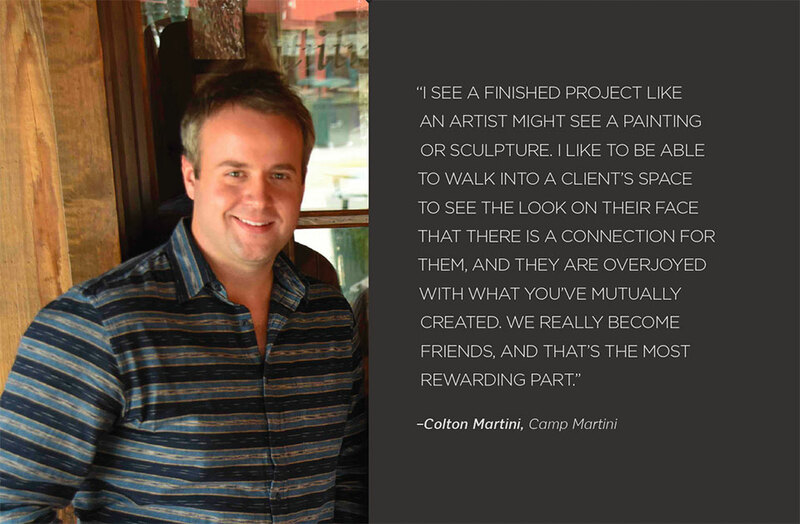 CM: I see a finished project like an artist might see a painting or sculpture. I like to be able to walk into a client’s space to see the look on their face that there is a connection for them, and they are overjoyed with what you’ve mutually created. We really become friends, and that’s the most rewarding part. HD: The most rewarding part for me is that I get to do what I love to do every day. It’s rewarding to create spaces that reflect our client’s lifestyles and for them to be happy. I think spaces make a huge difference in how you feel. It’s extremely rewarding to work in our small community in the Flathead Valley. KS: In other areas, not everyone works and lives in the same place. It’s really nice.